This construction video tutorial briefly explains the types, grades and sizes of steel as per standard IS 456:2000. IS 456-2000 Code of Practice belongs to an Indian Standard code of practice for normal structural exercise of plain and reinforced concrete. This code employs the limit state design approach along with working stress design approach. It is only applicable in India. From this standard, detailed information can be obtained on the different characteristics of concrete. Steel with minimum diameter of 5 mm to 50 mm are generally available in the construction projects in India. But steel bars having diameter of 8 mm and 32 mm are mostly used here. On the basis of surface, the steel bars are available with two different types – plain bars containing smooth surface and deformed bars containing rough surface as well as lugs on surface. These lugs improve the bonding strength among steel and concrete. The grade of steel is dependent on yield strength of steel. 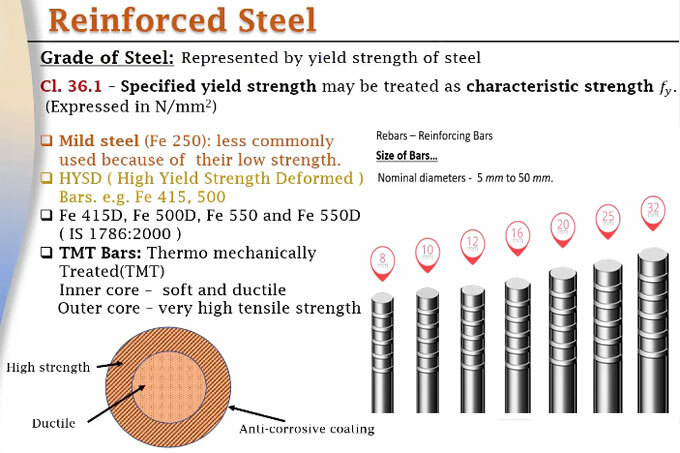 Yield strength is considered as characteristic strength (fy) and presented as N/mm2. Mild Steel (Fe 250) Bars : Due to low strength, these bars are seldom used. Here, Fe denotes iron and 250 denotes yield strength in megapascal. Other additional types of grades like Fe 415D, Fe 500D, Fe 550 and Fe550D (IS 1786:2000). These newest grades are launched as per standard IS 1786:2000. Some advance technology like TMT Bars called as Thermo mechanically treated (TMT) are introduced to resist corrosion in steel. Their inner core is soft and ductile and exterior core contains extreme tensile strength. These provide higher strength. Here D denotes greater ductility. To gather more information, watch the following video.